Pick up any bodybuilding magazine and you’ll be hard pressed to find a training article that does not push lengthy, multiple-set routines. The predominant concept, “If it’s worth doing, it’s worth overdoing,” takes me back to 1970, when Arthur Jones challenged the body-building world with his “more is NOT better” philosophy. It’s time to revisit and update why training less is usually best. “If in doubt . . . train less,” is an important concept taken from the writings of Arthur Jones. Jones, the inventor of Nautilus and MedX strength-training equipment, is also the man most responsible for the popularity of high-intensity training (HIT). Jones’s quote concerning training less needs clarification. The key to using it to your advantage requires a brief chronology of the man, some of his experiences, and a few ideas of my own. I first met Arthur in 1970. He confronted me by suggesting that I forget everything I knew about bodybuilding. Then, and only then, he insisted, could I understand his new philosophy of training. Jones’s philosophy centered on exercising harder, but briefer. Arthur Jones started me thinking in a different direction. Instead of looking for ways to train more – by mixing various sets and cycles, splitting my workout days into upper and lower body, and exploring new exercises – he taught me how to get better results with fewer exercises and shorter routines. It worked. In 1972, I got into the best shape of my life and won the Collegiate Mr. America contest. Shortly thereafter, I joined Jones as Director of Research for Nautilus Sports/Medical Industries, where I remained for more than 17 years. Throughout those years, I published many books on Nautilus equipment, free weights, and the merits of high-intensity training. Nautilus and high-intensity training flourished in the 1970s and 80s. Millions of people were turned on to a harder-but-briefer style of exercising. In my travels throughout the country, recently I’ve observed that many trainees have forgotten Arthur Jones and his concepts. On one hand, this would be expected since Jones retired in 1996, isolated himself from the public, and eventually died in 2007. On the other hand, there are multiple web sites with discussion forums that consistently rehash many of Jones’s original principles – debating the right, wrong, and in-between. Extremists seem to be the norm on the internet. Recommended HIT routines, for example, vary from a high of 20 exercises four times per week to a low of 3 exercises in two weeks. That’s quite a range. After more than 70 years of interest in strength training, what were Jones’s concluding beliefs on training duration and frequency? The last several years of Jones’s life, I spent many interesting mornings with him at his home in Ocala, Florida. Often we talked training duration and frequency and I remember well his answers to my questions – answers that will help any HIT enthusiast clarify his quest to get bigger and stronger. Plus, an understanding of Jones’s early exercise experiences will allow you to appreciate WHY and HOW he eventually organized his training philosophy. In 1936, at the age of 10, Arthur Jones became interested in weight training. He also practiced gymnastics, which explains why chin-ups and dips were two of his favorite exercises. According to Jones, he was well built by the time he turned 14. Over the next 15 years, Jones’s training was inconsistent. It was on and off, on and off since the necessary equipment was in short supply as he explored the world. When he trained, however, he settled on a routine that entailed three weekly workouts of four sets of 12 different exercises. Such workouts brought Arthur’s body mass up to 172 pounds. At 172 pounds, however, his progress plateaued. Additional exercises and extra sets did not provide the answer. Thus, Arthur typically stopped in disgust – he quit training for months, or even years. Finally, after several more episodes of yo-yoing between 150 and 172 pounds, Jones decided to do something different – radically different. He cut his routine in half. Rather than four sets, he performed each of the 12 exercises on only two sets. What was Jones’s outcome of half as much exercise? Within a few weeks, Jones reached a muscular size and strength level that was far above anything he had been able to produce previously. With longer workouts, Arthur reasoned, he had been preventing additional growth by not providing his body with enough rest after the initial stimulation. In other words, he had been overtraining – he had been doing too much exercise. Once I questioned Jones about the time in his life when his body was at its biggest and strongest? In 1954 Arthur would have been 28 years of age. At the time of our conversation, early 2003, almost five decades had passed and Arthur had traveled the world extensively, developed both Nautilus machines and MedX strength-testing tools, written more than 300 related articles, funded meaningful university research, and retired comfortably to think about it all. “I would’ve trained less,” he replied. “Instead of 12 exercises, I would have reduced the number to 8. Instead of two sets, I would have performed only one set. Instead of training three times per week, I would have trained twice a week. “Training in such a fashion, I believe I would’ve reached a body weight of 205 pounds – or even heavier – faster! Okay, let’s take Arthur Jones’s advice of . . . One set of 8 exercises, twice a week . . . to heart. Jones and I both like the idea of an “A” and a “B” workout. The A Routine would be performed on Monday of each week, and the B Routine on Thursday or Friday. To supplement the above routines, occasionally I’d substitute the leg press machine for the squat. Or of you can’t do the squat properly, then you might do the leg press exclusively. The other possible modification to the A Routine would be in the #8 exercise, wrist curl. You could substitute a number of other movements here: reverse wrist curl, trunk curl (or other abdominal exercises), or neck work (the 4-way neck machine would be my first choice). For the B Routine, you could do the leg curl machine instead of the stiff-legged deadlift, and the leg extension machine instead of the calf raise. Of course, all of the above assumes that you are already an advanced trainee who works intensively and progressively – in good form. After performing one set of 8 exercises twice a week for many months, is it possible to reach a plateau? Yes, I’ve worked with a few very strong bodybuilders who have done just that. The next step is to reduce the exercises by two and adhere to the same frequency: one set of 6 exercises twice a week. Then, if another plateau is reached, I’d recommend decreasing the frequency, but increasing the exercises slightly. In other words, you’d go back to 8 exercises for one-and-one-half times per week – which equals 8 exercises three times in two weeks. Eventually, a few men may require once-a-week training. I’ve worked with only five men, who I would place in that category. That’s five men out of thousands that I’ve worked with over 50 years. Can you reduce your training too much? Obviously, there’s a time and place in your life where less isn’t always better! More exercise might be a consideration (up to a point) during rehabilitation, recovering from injury, practicing maintenance, or perhaps in the senior years. The vast majority of people involved in strength training and bodybuilding, however, do too much, rather than too little, exercise. Remember, if your progress is at a standstill, or if you’re dissatisfied with your results – then train less . . . but work harder. • Two sets are better than four sets, and that one set is better than two. • 8 exercises are better than 12. • Training two days per week is better than three. Sure, some athletes with the right genetics can grow to massive proportions on much more exercise than is recommended above. Arthur Jones himself proved that. But the same athletes would have gotten even better results if they had trained less. Do not assume that you’re an exception to Jones’s concepts. In fact, you’d be better off assuming that you’re not. It took Arthur Jones more than 30 years to learn that growth stimulation for a particular muscle requires only one, properly performed, set. It took him another 20 years to understand that overall muscular growth accelerates from shorter routines and more rest days. 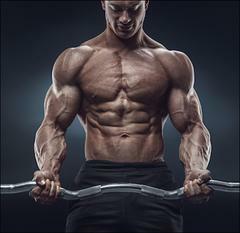 Decide today that you’re going to reach your full muscular potential in the most efficient manner. Understand and apply the Why of LESS.